Banning fish entirely is a bit extreme and only necessary for those who share my retching dislike of fish. But the troubling report issued by the advocacy group Environmental Defence does say to cut back and even eliminate some species of fresh water fish. Signs of toxic pollution that used to be found only in large fish, are present now in some mid-sized and small species. Why? The Great Lakes are even more polluted as you’ll see from the excerpts below. Fish lovers will want to check out the report for its advisories on which species are still safe to consume, and how frequently. If you believe the phrase ‘You are what you eat (and drink)’, then what are the polluted Great Lakes turning 40 million people into? Wonderful stuff you’re doing. Good memory hooks. I love this, Franke! I’ve long been aware that the Great Lakes contain hundreds of chemical contaminants… but no one ever seems to want to hear me mention it…. And I’ve long thought, how healthy can ANY fish be when every body of water on the Earth is polluted?? Well done. Short, not-so-sweet, but very hard-hitting & well-put…. Hey! This is great Franke. 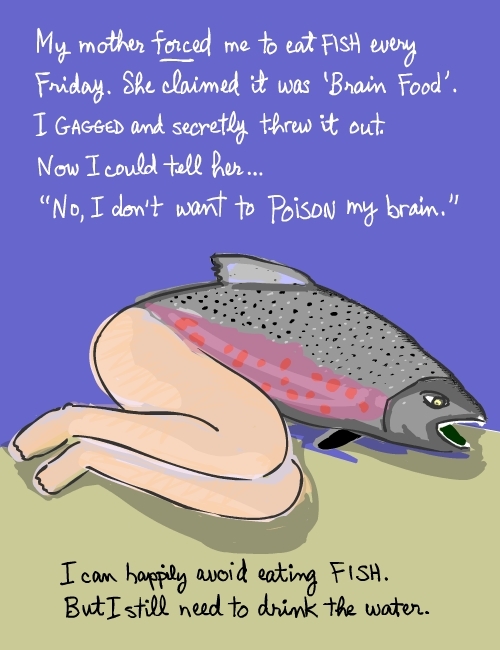 My thinking about fish — China is slammed for selling poisoned food to us. Some of it is fish. The story of the St Clair River from Sarnia-Windsor ON, and anecdotal information about fish in the North Saskatchewan River, both with petro-chemical industries on their shores, both with “sewage, pesticides, heavy metals and other pollutants” tell me what I remind my children: when you criticize someone else, usually it is yourself that you see in them. In 1992, 29,000 yellow rubber duckies were lost at sea when a container ship dropped them overboard halfway between China and Seattle (source: Link). Since then, they have turned up in Alaska, Hawaii, Iceland and Britain. Because it’s not just the Great Lakes that are polluted. And what we throw into one part of the world ends up, eventually, in another. We pay huge amounts of money to buy clean drinking water from the Alps and Tasmania, but we’re fooling ourselves that any part of this beautiful planet can ever really be clean and safe as long as we continue to dump poisons into the bays and lakes of another part of the world. What goes around comes around. The rubber duckies are still floating around the world. ‘Found’ duckies from the flotilla are collectors items. But people are missing the point. We can learn a lot from those ducks, if only we stop to listen to their warning. Thanks for dropping by and leaving your comment about the rubber duckies. You are right of course that we should be concerned about water everywhere. All the best! Keep the comments coming! They say that by 2050 the water in my area will be completely undrinkable. I’m not surprised — around here they use so many fertilizers, pesticides and other such chemicals that the lawns are BRIGHT GREEN almost year-round! After reading this article and the comments about it, I realized that wherever I go, there will be poisons in the water and air. I doubt I’ll be able to live the full length of my possible lifespan (100+ years), strongly.